Jaxon's daddy posted this inspiring video on his personal Facebook page that was shared by the performer Diddy. I figured I should share it with all of you. As parents of a visually impaired child, we were worried about our son being blind because blindness was not "normal" to us. Everyday, our visually impaired son shows us that overcoming the obstacles associated with blindness is now our "normal" and everyday it gets easier to cope with. 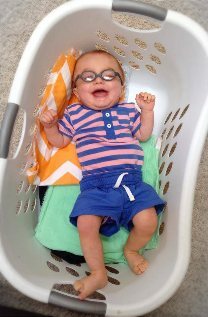 "When the doctor told me at 3 days old (after weeks of uncertainties as to why my son was so tiny before we saw him) that he would be blind, I had to go to corners of the hospital to keep from crying in front of Alyssa. 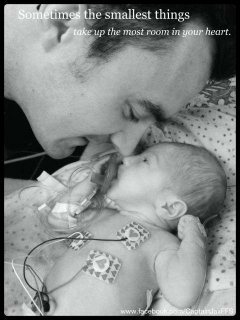 I remember calling my family and tearfully telling them that Jaxon would never see my face, or know what either of his parents look like. I cried in the hallway with Alyssa's mom after the first eye exam with the ophthomologist when Alyssa caught me after hiding it. This little boy is an example of the unexpected and unrelenting strength that I hoped to impress upon Jaxon. I had never known a blind person, and didn't have the first clue as to how to teach a son that couldn't see how to grow up, but I was determined. I post this because you might find yourself in what should be the most beautiful moment of your life turn into the most painful day that you'll never forget - either way you will grow, and your child will grow from your strength. Jaxon now crawls around with limited vision out of one eye, and to us he is "normal". He throws things on the ground, he cries when things are taken from him, and he smiles at you as he glares out of the one good part of his eye to get a good view of you. He is everything that makes me tear up out of joy just crawling and knowing where he's going. Occasionally he smacks his head on a door, but every placement of hand or knee is a learning moment, and not just for him. Enjoy every step of the way, every movement is a gift and privilege that might not always be there."